“Eventually our relationships with athletes over time are not only to do with winning but also how they win, the way they move on court and how they wear defeat, the manner in which they speak of opponents and toss their hair, the art they offer and the resolve they exude, the little peculiarities they own and the adversity they encounter, the people we are when they come into our lives and the spaces they fill. For they are fulfilling something fundamental we crave, slaking some complicated, private demand we have of champions and sport. In the end, it’s not about the score, you see, but how they make us feel.” – Rohit Brijnath writing in The Mint in October 2017. I shall remember that day for the rest of my life. It was the third of June 2005, the day Rafael Nadal and I met for the first time. It was his 19th birthday and Nadal was on Court Philippe Chatrier in Paris for the semi-finals of the world’s premier clay court tournament – the French Open – facing up to world No.1 Roger Federer, the most phenomenal talent to have hit the tennis world since Andre Agassi. I was glued to my television set in distant Mumbai waiting to see how far this teenager I had heard so much about in the preceding months would push Federer before he bowed out of his first Grand Slam semi-final. Yes, he had beaten Federer the first time they met the previous winter in the third round of the Miami Masters, but then so had five others in the intervening months, and there was no denying the injury the World No. 1 had been carrying. Federer had fully recovered and returned the favour in a five-set win in April at Kay Biscayne. It was true that young Nadal had piled up a 22-match unbeaten streak on the ATP circuit, but surely, even after his rapid climb to No. 5 in the rankings, this was too high a mountain to climb for the Spaniard against a Federer who was back to peak fitness and looking to join the elite group that had won all four Grand Slams? Rafa didn’t know it yet, but I was in love. It didn’t matter that I was only one of 100 million who fell in love all over again that night; it didn’t matter that for the first time in our wedded life my wife and I were in love with the same man; it didn’t matter that the object of my affection would remain on the wrong side of a television screen for the length of our romance. All that mattered was that Rafa Nadal had walked into the lives of a hundred million besotted humans like me and tennis would never be the same again. And for the next decade, for ‘Rafans’ like myself, the ‘Gregorian’ calendar was replaced by the ‘Garrosian’ one. The year for us started when Rafa walked on to the court at Roland Garros to brush aside like a broken doll the hapless soul who happened to be pitted against him in the first round that year. The year ended on ‘Garros eve’, the night before the ritual was played out the following year. And between the two dates, Rafa ruled. Sometimes he let others prevail to spare us the monotony, but seldom on red clay and never in Paris. That was hallowed ground, not to be soiled by the tread of the undeserving. The first part of Gregorian 2006 would become a pattern for much of Rafa’s early career. He missed the Australian Open because of a foot injury, had an indifferent hard court season and reminded Federer of the threat he now posed with a comprehensive win at the Dubai Open. Then he went into the clay season, won 24 consecutive matches and all four tournaments he entered, equaling Bjorn Borg’s record of winning 16 ATP titles as a teenager. Rafa’s successes were already beginning to ruffle sensitive feathers. By winning the first round of the French Open, he beat Guillermo Vilas’ 29-year-old record of 53 consecutive clay-court victories. Vilas handed over a trophy to him and then commented that Nadal’s feat was less impressive than his own because Nadal’s winning streak covered two years and was accomplished by adding easy tournaments to his schedule. An unperturbed Rafa marched into the finals and following a pattern that he had established during the season, brushed aside the world’s best player between French Opens, in four sets. In winning the French Open for the second time, Rafa Nadal also became the first player to ever defeat Federer in a Grand Slam final. In Mumbai, the bubbly flowed freely. That June at Queen’s Club, Rafa injured his shoulder and had to concede the quarter-final to Leyton Hewitt, ending a 26-match winning streak. He bounced back at Wimbledon, beat Andre Agassi in straight sets making it Agassi’s farewell match at SW19, won the next three matches in straight sets, and met Federer in the final. This time Federer would prevail in four sets, picking up his fourth successive Wimbledon title. The Gregorian year would end with a disappointing quarter-final Nadal loss at the US Open to World No. 54 Mikhail Youzhny. But Rafa would finish as world No. 2 for the second year running, the first man to do so since Agassi in 1994-95. In the new Garrosian year, Rafa would come storming back to take his third successive French Open title. Left holding the plate next to the trophy biting champion would be a resigned-looking Roger Federer. Then, in what by now would be a distressingly familiar scene to his fans, Rafa would pick up a knee injury at Wimbledon, once again losing in the final to Federer, but not before battling through the first five-set match the World No.1 had been forced to play since 2001. The rivalry of the new millennium was gathering steam on surfaces beyond clay. If there was one event in 2008 that garnered more headlines than the collapse of Lehman Brothers, it was the Beijing Olympics. For the tennis world, at stake was the Golden Slam, the once-in-four-years opportunity to win all four Grand Slams as well as the Olympic Gold medal. Only one player had ever achieved that, a certain Stephanie Graf, now happily retired in Las Vegas as Mrs Andre Agassi. Very early in the year, Roger Federer’s dream of achieving the slam was shattered by a semi-final defeat at the Australian Open to the newest wonder boy of tennis, Novak Djokovic. 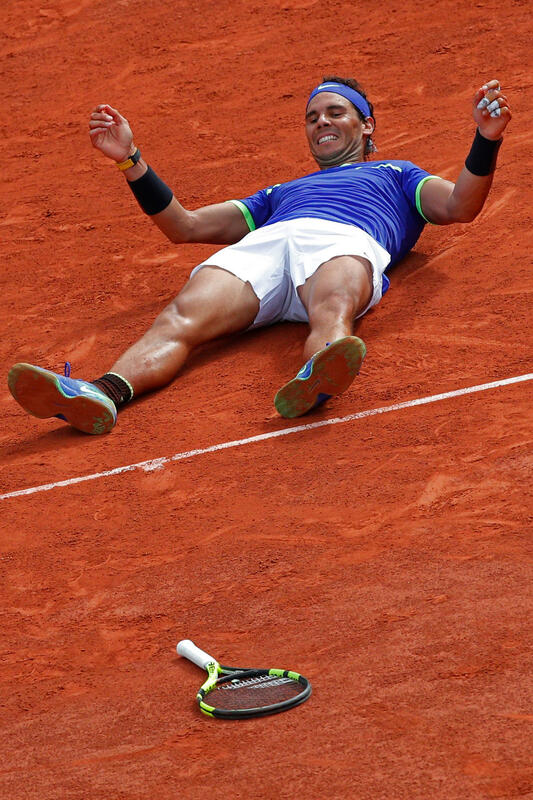 In a parallel universe, a million light-years away, Rafa’s dominant clay season was defined by a fourth successive Monte Carlo Masters, followed by a fourth successive Barcelona title, and a triumphant march through the first event of Garrosian 2008 without losing a set. So dominant was Rafa that his 6-1, 6-3, 6-0 decimation of Federer in the final added a rare humiliating bagel to the World No.1’s otherwise illustrious career, his first since 1999. Rafa was in sublime form, and he hardly seemed to notice a change in surface after Paris. Roger and Rafa met for the third successive time on the Centre Court of Wimbledon for an almost ridiculously hyped and anticipated match, with Rafa on a 23-match winning streak. In a jaw-dropping five-set encounter that has since been widely hailed as the greatest tennis match of all time, and certainly the greatest Wimbledon final in memory, Rafael Nadal finally put his demons to rest and climbed his own Everest, outlasting Roger Federer 6-4, 6-4, 6-7 (5), 6-7 (8), 9-7. At 9.16 pm, in virtual darkness on the sixth of July 2008 when the two titans of tennis finally put their racquets away, Wimbledon and the world of tennis sat stunned. In Mumbai, I didn’t sleep that night. I didn’t even go to work the next day. Garrosian 2008 was looking rosier by the day, and a month later it would get immeasurably better. On 17th of August 2008, Rafael Nadal won the gold medal at the Beijing Olympics. On the 18th of August, for the first time in his career, he became world No. 1, ending Federer’s 4.5-year long reign over the world of tennis. Clay had been mastered, grass had been conquered, and the little gold disc won on the hard courts of Beijing hinted that Rafans might hope for more. Sure enough, Rafa delivered, with a march into the finals of the Australian Open in 2009. Waiting for him was Roger Federer. But this was Garrosian 2008. This was Rafa Nadal’s year. Rafa beat Federer in five sets and for the first time stood victorious on the podium at a hardcourt Grand Slam final. The prodigy was delivering on his promise and had ceased to be sneered at as a ‘clay court specialist’. A few critics were eating their premature words. At the end of Gregorian 2009, a relieved Federer took back the No. 1 spot having finally won a French Open beating Robin Soderling, never mind that the victory tasted hollow without Rafa in the fray. Suffering from severe untreated tendinitis in both knees, Rafa lost a match for the first time at the French Open (to Soderling in the fourth round) and was forced to withdraw from competitive tennis. But if Garrosian 2008 had been Rafa’s best year so far, Garrosian 2010 was destined to be even better. A fully fit Rafa started the clay court season having retired midway through his quarter-final encounter against Andy Murray at the Australian Open with his knees continuing to play up. With victories at Monaco, Rome and then at Madrid, where he beat Federer, there was little doubt his opponents in Paris would have their work cut out. Rafa had sweet revenge on Soderling, defeating him in the finals after the Swede had made short work of Federer in the quarters. Rafa’s form continued into the grass court season and at SW19 he beat Murray in the semi-finals and Tomas Berdych in the finals without dropping a set against either. A second title on grass silenced a few more doubting Thomases. At the US Open, Rafa was the top seed for the second time in three years. He did not disappoint the organisers or his fans, brushing aside all opposition on his way to his first finals at the US Open, all without dropping a set. In the final, he beat Novak Djokovic in four sets to become only the second man after Andre Agassi to complete a career Grand Slam. Further, Rafa’s US Open victory meant that he also became the first man to win majors on clay, grass, and hard court in the same year, and the first to win the French Open, Wimbledon, and the US Open in the same year since Rod Laver in 1969. The critics were beginning to slide into their holes in the wall. Rafa would end Gregorian 2010 as the undisputed No. 1 in the world. The champagne never tasted better when my wife and I clinked glasses that year-end at our new home in London. If the Nadal-Federer rivalry was the prime time show from 2005 to 2010, the rise of Novak Djokovic would ensure that the focus thereafter shifted to Novak’s showdowns with Rafa. At the time of going to press, Rafa and Novak have met 50 times, more often than any other pair in Open era history and Novak enjoys a slender 26-24 lead in these clashes. 2011 was when it all started with Novak prevailing in four sets each at Wimbledon and the US Open, and in a five-set marathon at the 2012 Australian Open. At the end of that five-hour, 53-minute encounter, the longest final in Grand Slam history, I would have a long lie down, too exhausted to go to work. Five months later, Rafa would have his revenge in some small measure when he beat Djokovic in four sets at Court Philippe Chatrier to claim his seventh French Open title. This would mark the first time where two players faced each other in four consecutive Grand Slam tournament finals. Nadal and Djokovic would also become the only players to have faced the same opponent in the finals of all four majors. Nadal’s uncompromising, give-it-all style of play would finally take its toll on his stretched-to-the-limits body. Mental toughness would bow to physical reality. Struggling through the first round of Wimbledon, Rafa’s knees would start to give way. In the second round, he would lose to Lukas Rasol, ranked 100th in the world. Rafans would, however, realise the seriousness of his ailment when the fiercely patriotic Rafa withdrew from the 2012 Olympics. It would be the start of the Garrosian year before Rafa would make his first appearance in 11 months at a Grand Slam. He would beat Djokovic in four hours and 27 minutes at Paris in the semi-finals in a match that would rank up in the stars as one of the greatest clay court matches of all time, and then make short work of David Ferrer in the finals. But that was all the joy Rafa would have with Djokovic in the form of his life across surfaces, picking up Grand Slams almost at will. 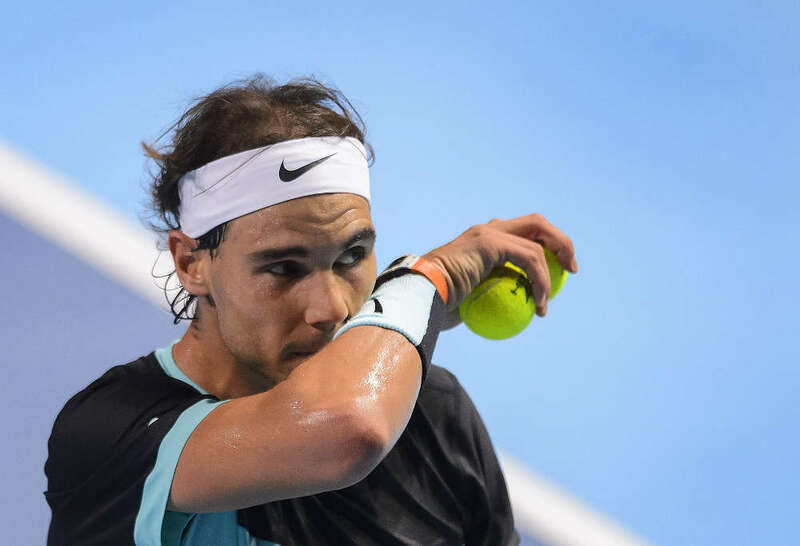 Having recovered from knee troubles, Rafa would damage his wrists… twice. He would struggle through the next few months with sporadic appearances at the majors. His battles through the pain and the resulting losses at these appearances would be hard to witness. The months of injury and drought would stretch into years. Tennis channel subscriptions would be given up at Rafan homes. The allure of Eurostar as a shortcut to heaven (read: Paris) would fade away. To get away from it all, I would move to Singapore. And then, almost three years after the battles with injury and the dominance of Djokovic started, 2017 would be upon us. Like a breath of fresh air, a rejuvenated and fully fit Nadal, serving with more purpose and power than he had in years, would start hitting his forehands with the deadly accuracy and the 4900 revolutions per minute of spin (Sampras and Agassi hit at 1800 and Federer achieves 2700) that had long been missing from his armoury. 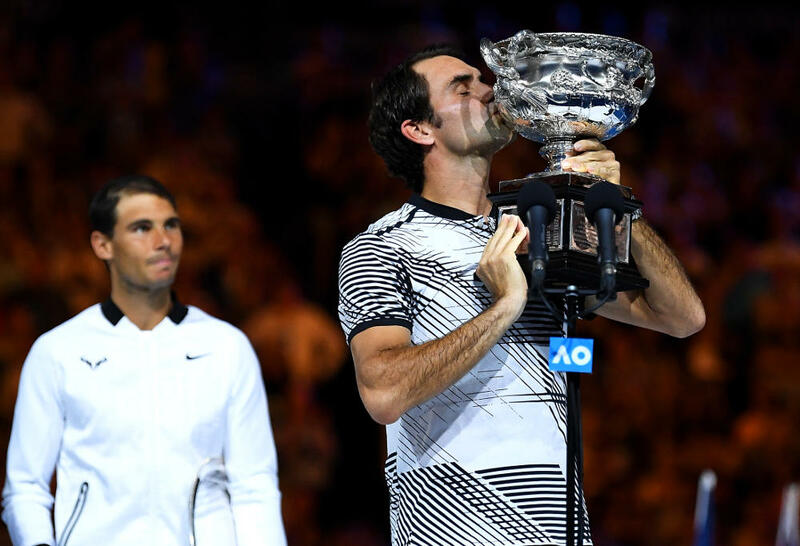 The 2017 Australian Open would breathe new life into Rafan hearts and bells of joy would toll in the new year at Rafan homes. It would also reignite passion and interest in tennis among a wider group of fans who had borne a period of indifferent tennis from a new generation of semi-committed talented players while the Big 4 of Tennis – Nadal, Federer, Djokovic and Murray – were all waylaid by injuries. On a warm January day in Melbourne, history would be made. 17:14 would be the count going into a final match that any bookie in the world would have given a 500:1 odds on six months earlier; 36-year-old Roger Federer’s 17 Grand Slam titles versus 31-year-old Rafa Nadal’s 14. Two elder statesmen of tennis putting players half their age to shame with their art and their fitness. A day earlier, finals tickets were being sold for up to A$16,000 – more than it cost to buy a house in Melbourne when Rod Laver won his last title. The world was gearing up for a battle royale, and true to the script, the titans would deliver. At the three hour mark with the scoreline reading 6-4, 3-6, 6-1, 3-6 and 3-1 in the fifth set, the more recent converts to Rafanism were opening bottles of the bubbly. In Singapore, I had run out of nails to chew on. And then it was that time of the year, a special year. Rafa had lost in Australia but barely, and every month since then he had been growing in strength and resolve. The Rafa army marched through Monaco and Barcelona picking up their 10th title in each location and leaving opponents and fans alike shaking their heads in disbelief – no man had ever won two majors ten times each. All eyes were now on La Decima, the big one. Could Rafa do the unimagined? Win the Garrosian Slam and become the first tennis player in the Open Era to win a 10th Grand Slam? The man who had not won a Grand Slam in three long years would win every set he played in the tournament, dropping a total of 35 games over his seven matches. Only Bjorn Borg had a better Open Era record having once dropped only 32 games on his way to a Grand Slam title. The 6-2, 6-3, 6-1 scoreline in the final said it all. Roger Federer would have the good sense to stay home and enjoy the Swiss summer while compatriot Stan Wawrinka filled in as the unfortunate soul fated to be on the other side of the net in this slaughter of the innocent. Almost as if Rafa and Roger had made a pact at the beginning of the year to share the riches of conquest, Rafa would make an appearance at Wimbledon but lose to unfancied Gilles Muller in five sets. Federer would win his 19th Slam at Wimbledon with a display of sublime tennis. Notwithstanding this, against all odds, on the 21st of August, Rafa would take back the World No.1 position from Andy Murray, and he would finish 2017 still at the top. A few remarkable records would be set. • It would be the 726th straight week that one of the Fab 4 – Nadal, Federer, Djokovic or Murray – would end on top of the ATP rankings. • It would be nine years and three days after the first time, the longest span for any player between first and most recent dates at No. 1 in the history of the ATP World Tour. • Despite all the injury layoffs since his last day at No. 1 more than three years ago, Rafa would manage to stay in the top ten every week since April 2005 (when he was 18 years old). • Rafa would become the oldest player, and the first person above 30, to hold the year-end Number One position. And between August 21, when he wrested the crown from Murray, and the Paris Masters, where he was confirmed as year-end Number One, almost unobtrusively, Rafa would win the US Open, defeating Kevin Anderson in the finals in straight sets and adding a 16th crown to his overflowing Grand Slam treasury. With a smile that stretched his ears, Rafa Nadal would fall flat on his back on to the blue court, arms aloft. Romance would be in the air. At Sweet Sixteen, twelve years on, my wife and I would renew our vows of love to the same man, 15,000 kilometres and a heartbeat away.